There are countless brands of cereal around the world, and some of them are more popular than most. We’ve got the likes of Cap’n Crunch, Cinnamon Toast Crunch, Cookie Crisp, and Lucky Charms. Of course, no list of cereals would be complete with adding Reese’s Puffs – and it’s this brand that has brought out a new loved-up Valentine’s Day cereal. We’re pretty sure that peanut butter is our soulmate because it never lets us down and makes us feel all warm and fuzzy inside. It’s this ingredient that has made Reese’s Puffs so popular over the years. Since introducing this peanut butter cereal into our lives, they have never been the same. However, Reese’s Puffs are so much more than peanut buttery puffs. The head honchos behind Reese’s have been incredibly smart with their products, and have released various different editions. We’ve seen the classic shape hit the shelves throughout the year, we’ve seen the bunny shape make its way into homes during the Easter season, and we’ve even seen adorable little bats try to spook those who love Halloween. For Valentines Day 2019, the company has released a new limited shape. Can you guess what it is? 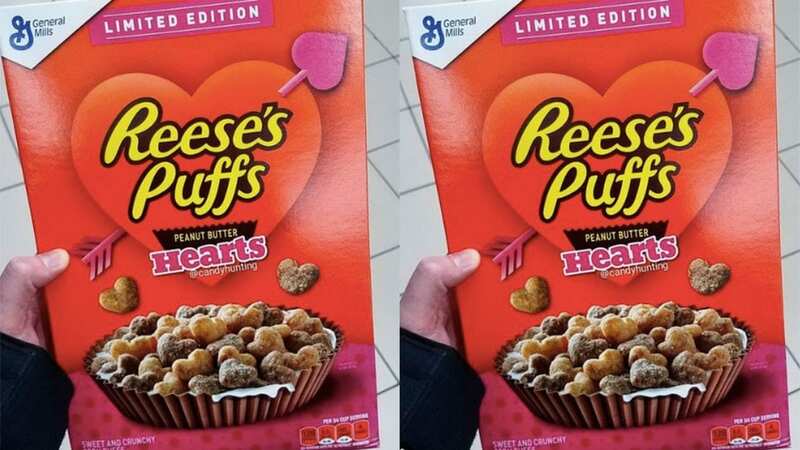 Yes, the new limited edition Reese’s Puffs is shaped into a heart for those loved-up couples who just want to share their cereal together. By share, we of course mean eat the whole box in one sitting. The new boxes will make their way into stores across the United States just in time for February 14, and some stores are even selling two boxes for $5! Time to stock up before they all go. Reese’s Puffs are arguably the best cereal in existence, so why not grab a box and share it with your loved one? Or eat it all by yourself!